At Pearl Harbor, one of America's most sacred spots, the complex standing vigil over the site of the history-changing Japanese attack is on its very last legs. 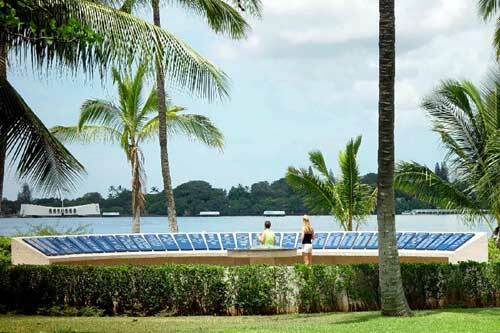 When the 65th anniversary of the surprise 1941 siege arrives Thursday, it will find the USS Arizona Memorial Museum and visitors' center in Hawaii deteriorating so fast that it could have as few as two years of life left. Built on landfill near the final underwater resting place of the battleship Arizona and the 1,177 souls who went down with it, the center has itself sunk as much as 30 inches into the soil. The Remembrance Circle at the USS Arizona Memorial at Pearl Harbor, Hawaii. Engineers have jacked up the facility four times to no lasting success. As a result, water seeping in from the harbor is threatening the concrete underpinnings of the buildings. "It's a real problem," said George Sullivan, board chairman of the Arizona Memorial Museum Association. It's not the only one. Blessed with a tourist popularity beyond anyone's expectation, the site often can be swamped with 4,500 visitors a day during peak periods - more than double the number it was designed to accommodate when it was built in1980. That means many of the 1.5 million visitors per year must wait two hours in line to file through. On the busiest days, more than 1,500 people are turned away entirely. And, then there are the woes of the existing museum, where priceless historical artifacts are at risk because the building's open-air design doesn't allow for the atmospheric control necessary to protect them from the elements. As a result, Sullivan said, plans for a new, larger facility are moving full speed ahead, as a fundraising campaign edges closer to its $50 million construction goal. If they can get $28 million in cash, groundbreaking can occur by next year's 66th anniversary of the attack, which took the lives of 2,390 U.S. military service members and civilians, and launched America into the bruising war in the Pacific. The latest tallies show that collecting another $7 million will accomplish that goal, Sullivan said. So far, 114 major donors - companies and celebrities - have stepped up with contributions of $10,000 or more. Among them have been defense contractors Northrop Grumman and General Dynamics as well as Microsoft founder Bill Gates and actor Tom Hanks. Memorial boosters say the grassroots support has been heartwarming. A fourth-grade class in Punta Gorda, Fla., for instance, has raised $7,000 so far toward its $10,000 goal. Senior citizens on fixed incomes also have been enthusiastic donors, said Donna Bebber, development director for the Pearl Harbor Memorial Fund. "This is something that belongs to the American people," she said. If enough money comes in, plans for what would be renamed the Pearl Harbor Memorial Museum and Visitor Center envision a five-acre expansion and a near doubling of the size of the existing museum. The museum would be state-of-the-art and enclosed from the elements. A research and education center would be added, with a library and a facility suitable for teleconferencing. An outdoors amphitheatre, expanded bookstore and larger areas for visitors to eat and rest would round out the improvements, Sullivan said. If things proceed smoothly, the new complex could be opened by the attacks 68th anniversary in 2009. "We want to make the visitor experience much better ... and preserve history for future generations," Sullivan said. Call the fund at 1-866-332-1941; or write Pearl Harbor Memorial Fund, 1 Arizona Memorial Place, Honolulu, Hawaii 96818.